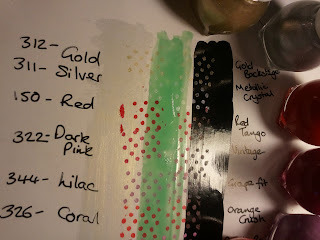 I was asked in a previous post which Miss Sporty polishes are good for stamping with. 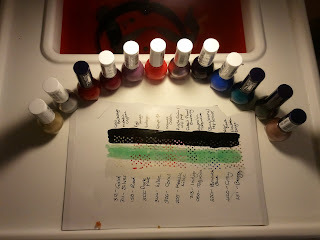 Being new to stamping, I'm on the lookout for good stamping polishes as I don't want to spend a lot of money on the special konad polishes when all you can use them for are stamping. I read somewhere (I can't remember where or I would give credit, really sorry) that Miss Sporty polishes stamp well, and as they're so affordable (£1.99 for 7ml and often on offer) I picked up a few and tried them. 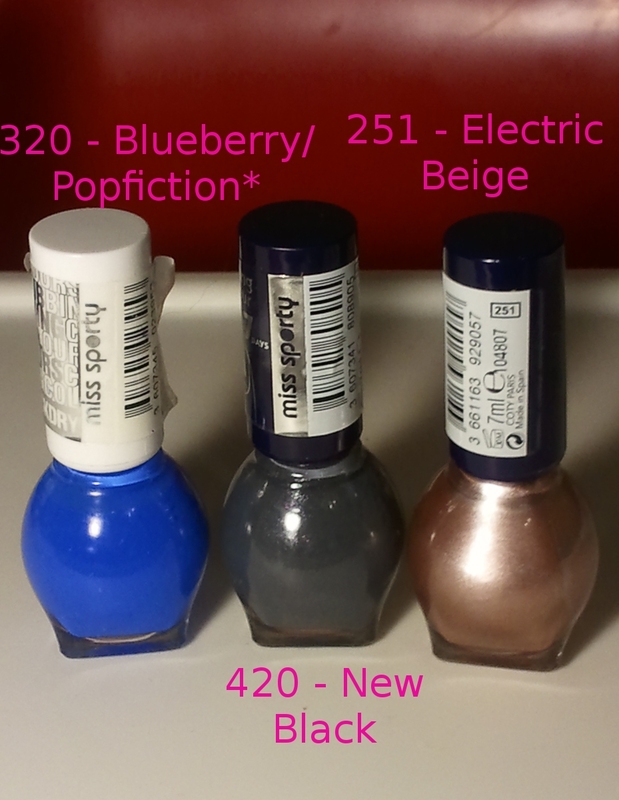 I was pleased to find that the first couple I picked up stamped well and now have a total of 12 Miss Sporty polishes! But, at £1.99 each you can't complain, and a couple were bought with the Boots 3 for 2 offer, and about 6 were bought recently as they are £1.99 for two (so BOGOF) in Superdrug at the moment. If I can before the offer ends I'm going to get the yellow and black, although I've not seen the yellow in stores. 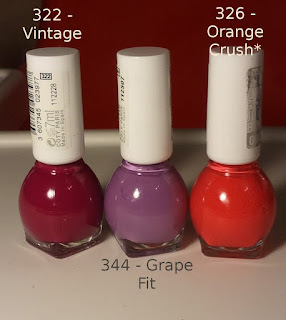 Miss Sporty does not name their polishes on the bottle, they are numbered, although on the website they are named, but not numbered. 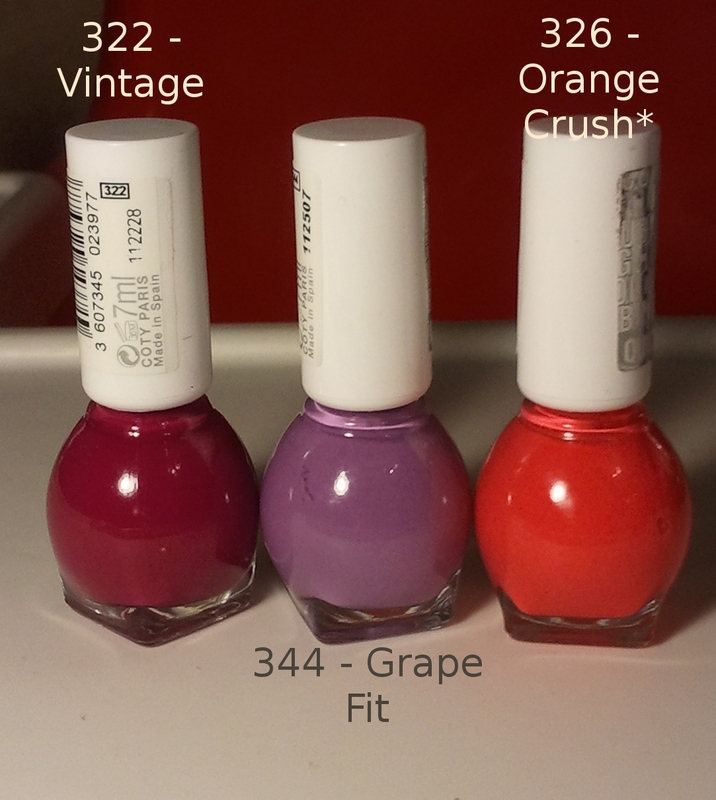 The swatches/pictures on the website are fairly good, but there were a couple of polishes that I couldn't work out the name of the colour, so these are marked with a *. The numbers are all correct though, so if you're buying in store you can go by the number. 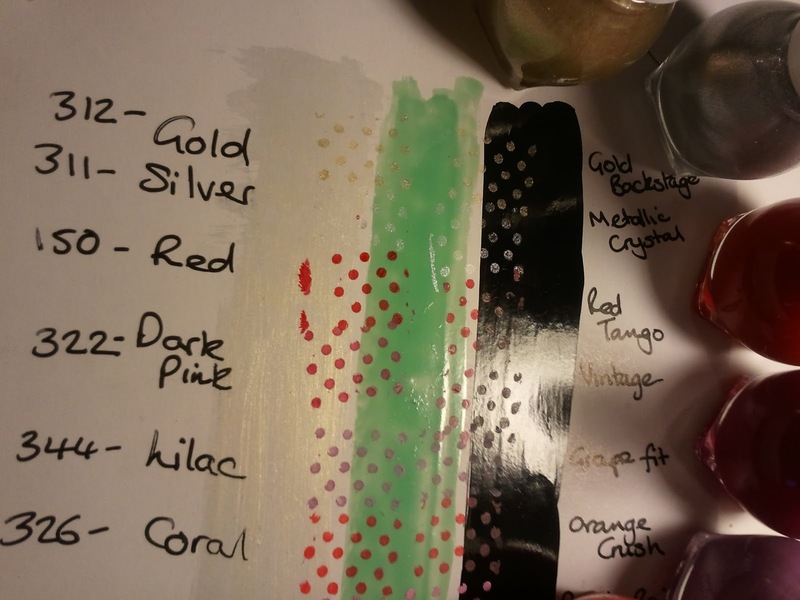 I also put my own description of the colour, as the picures are not hugely colour accurate, so I hope that helps. 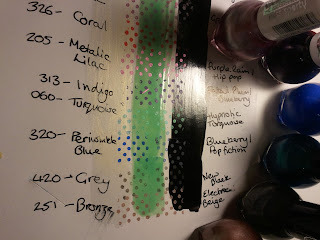 I tested each polish over black (Wet n Wild Wild Shine Black Creme), green (Barry M Mint Green) and white (Beauty UK Frozen Kingdom) using the polkadot full nail image from my born pretty fauxnad plate M79 on white cardboard. Apologies for poor light quality. I still need to figure out better camera settings for evening lighting. 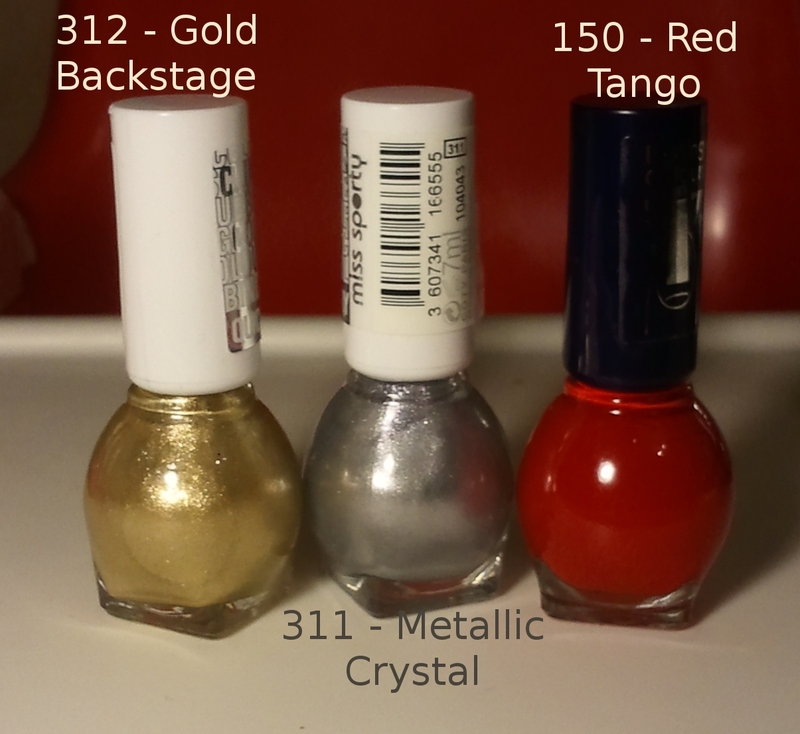 In summary, the only polish out of the 12 I have that was not good for stamping was the silver, which was disappointing. I guess if you wanted a subtle look over a darker colour you could use this, but it wouldn't be suitable for an intricate design. Out of the rest, the gold, metallic lilac and bronze worked the best over all colours, although the bronze and gold are quite similar. The cremes weren't great over the black, but were still visible. I hope this has been helpful! I also wanted to show you the "set-up" I use when stamping. After playing around a few times, this is what I find easiest, but I welcome any suggestions! On the left I have a dish with a capful of polish remover, a cotton pad soaked in polish remover, a dry cotton pad and some cotton buds. If you set it out this way you don't have to touch any remover with your hands and potentially ruin your manicure. I use the wet cotton pad to wipe the stamper and scraper inbetween stamps (I just leave it on the plate and wipe the stamper/scraper against it to avoid picking it up), the dry one to wipe the stamper, scraper and plate with, and the remover and cotton buds to clean the image plate with, before wiping off any excess with the dry cotton pad. Then you can see an old gift card I use as my scraper. I find this easier than using the scraper you're meant to use as it's flexible, and it doesn't scratch the image plate. Then on the right hand side you can see my stamper, image plate, more cotton buds and a nail buffer. In desperation when I was starting out I stalked around youtube looking at konad tutorials and found this. I wasn't sure if it would work, and I didn't want to ruin my one and only stamper, but it did help. I just gently run the old, blunt shaping side of this buffer across the surface of the stamper every now and then (say, every 3 or 4 manicures) and it somehow helps it pick up the polish better. Sorry this has turned into a bit of a long winded post, but I think I covered everything I wanted to! 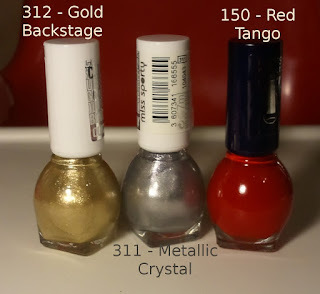 As I pick up more Miss Sporty polishes I'll test them out and add them to this post. 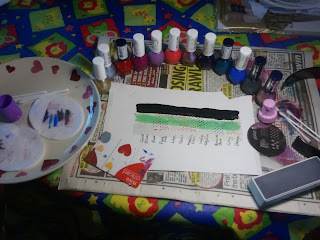 Let me know if you give any a go and if they're worth having for stamping. For such a great price you can't go wrong, and they're all nice polishes anyway, so even though the silver didn't stamp well like I hoped I'm happy I have it! These colors are gorgeous . Whether they are for stamping or not . Good luck ! Oooh, I didn't know they had names on the website - *heads off to check out the names! Great resource post for UK stampers too! 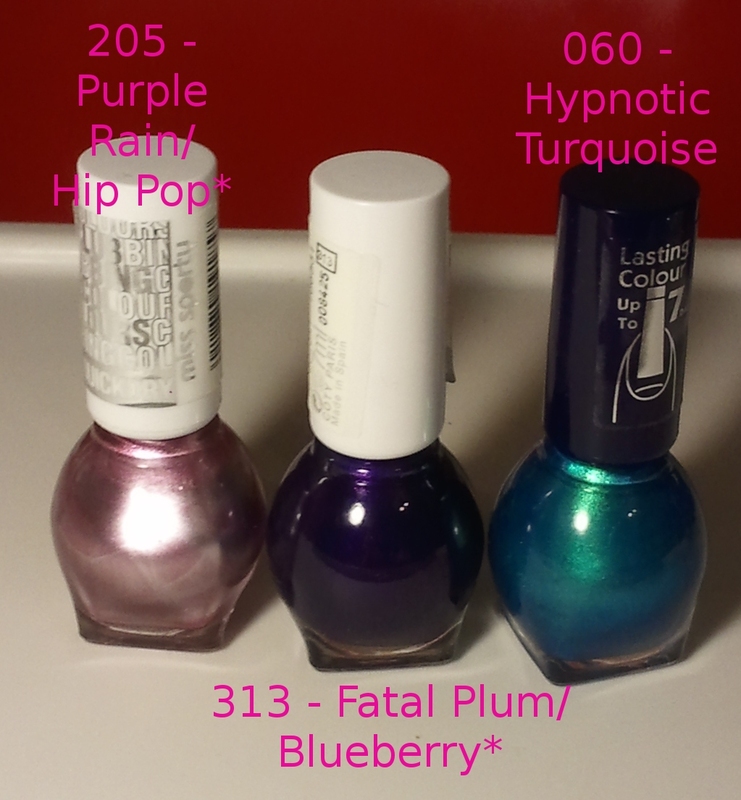 @Toyomi That what I figured, even if they don't work for stamping they're still pretty polishes! @Cali Why they don't put the names on the bottle I don't know! Some of the polishes I have used here look nothing like anything on the website, so I had to guess some of the names and probably got a few wrong! Hey trouble! Glad you see you've found Miss Sporty as good as I have for stamping! Very comprehensive post. Excellent consumer advice. Ahh what a insightful post, thanks for doing this. I have found that Stargazer silver chrome is good for stamping. Will you let us know how the black stamps?